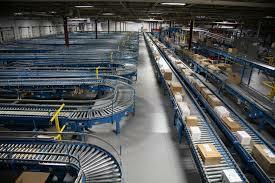 If you need conveyor belts, rollers, fasteners, belt repair tools, or other replacement conveyor parts, you can find them at Brown Engineering. Did you know that in Ancient Rome, many different hydraulic applications were developed, including public water supplies? 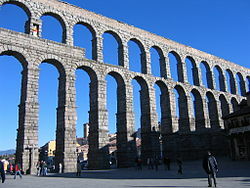 Innumerable aqueducts were powered using watermills and hydraulic mining. The Romans were also among the first to make use of the siphon to carry water across valleys. A hydraulic valve properly directs the flow of a liquid medium, usually oil, through your hydraulic system. The direction of the oil flow is determined by the position of a spool. A hydraulic system can only function – as per requirements – by using valves. Basic valve types include manually operated, air or solenoid operated and pilot operated. Select the hydraulic cylinder that best suits the application. Select the series of hydraulic pump with adequate oil output and reservoir capacity to power cylinder. Select pump within series with the valve option that best matches cylinder, pump and application. Will the valve be used with single or double-acting cylinder? Will the valve be mounted on the pump, away from the pump or directly into the hydraulic lines? Will the valve be manually operated? Is independent control of multiple cylinders, or hydraulic tools preferred? What directional control and pressure control valve functions are needed for the application? Load Lowering Valve – Provides precision metering for controlled return of the cylinder piston. Sequence Valve – Used when a cylinder in a multiple cylinder application must advance before any other. Pressure Reducing Valve – Permits independent pressure control to two or more clamping systems operated by a single power source. Check Valve – Permits flow of hydraulic oil in one direction only. Pressure Relief Valve – Used at remote location in a hydraulic circuit where maximum pressure requirements are less than the setting of the basic overload valve in the pump. Protects a hydraulic system against over pressurization. Metering Valve – Restricts surges by restricting flow to a certain level; when flow subsides, valve reopens automatically. For systems using large cylinders or extended lengths of hose. Pressure Regulator Valve – Permits external adjustment of operating pressures at various values below the internal relief valve setting of the pump. A Hydraulic cylinder (also called a linear hydraulic motor) is a mechanical actuator that is used to give a unidirectional force through a unidirectional stroke. In other words, a hydraulic cylinder converts the energy stored in the hydraulic fluid into a force used to move the cylinder in a linear direction. It has many applications, notably in construction equipment, vehicles, and manufacturing machinery. There are various components that form hydraulic cylinders. These include the cylinder bottom, cylinder bottom connection, cylinder barrel, cylinder head, piston, piston rod, and the piston rod connection. Some of hydraulic cylinders may also have feet used to mount the barrels. Bore Diameter: It is the diameter of the cylinder bore. Maximum operating pressure: The maximum working pressure a cylinder can carry is known as maximum operating pressure. Rod Diameter: It is the diameter of the piston or the rod that are used in hydraulic cylinders. 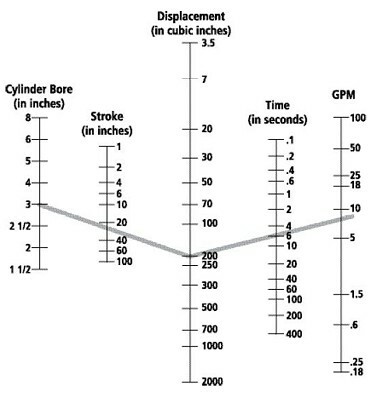 Stroke: The distance traveled by a piston in a hydraulic cylinder is known as stroke. The length of a stroke could be several feet, or a fraction of an inch. Type Of Cylinder: The different types of cylinders are tie-rod cylinder, ram cylinder and welded cylinder. Tie-rod cylinder: These types of hydraulic cylinders make use of a single or multiple tie-rods to provide extra stability to the cylinder. The tie-rods are mostly installed on the exterior diameter of the cylinder. The tie-rods carry most of the load in this type of hydraulic cylinder. Welded cylinder: There are heavy-duty welded cylinders used to balance the cylinder. The welded cylinders are smooth hydraulic cylinders. Ram cylinders: As the name suggests, this cylinder acts as a ram. The cross-section of the moving components is half of the cross-section area of the piston rod. These hydraulic ram cylinders are not used to push and are mostly used to pull. The ram cylinder is a hydraulic cylinder that is used in applications of high pressure. Single Acting Cylinders: In single acting cylinders the fluid is pressurized from only one side of the cylinder during both the expansion as well as the retraction process. A spring or an external load is used to return the cylinder top to its original position when pressure of the fluid is cut off. Double Acting Cylinders: In double acting cylinders, the pressure from the fluid is applied in both the directions. Single cylinders that consist of springs are not used in large stroke applications because there are inherent mechanical problems associated with the spring. The double acting rods could be of two types: Single rod ended AND Double rod ended. Plunger Cylinders-These cylinders are also known as Ram cylinders. These types of hydraulic cylinders are placed in an upright position. This is done so that once the supply of the fluid is stopped, the weight on the cylinder will make it return to its original position. The cylinders used in automobile service centers are a good example of the plunger cylinders. 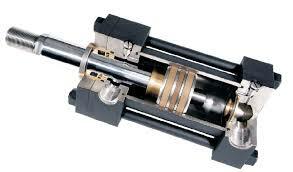 Telescoping Cylinders-Telescopic cylinders are also known as multistage hydraulic cylinders. These cylinders have at the most six stages. These are specially used in applications where there is less area. Telescopic cylinders can either be single action or double action. The stroke of these cylinders is long and is used in applications such as cranes and forklifts, etc. Cable Cylinders-The cable cylinders can either be hydraulic or pneumatic powered cylinders that are of the double acting type. These cylinders have long strokes and produce moderate force. The cable cylinders can be operated in limited space. Diaphragm Cylinders-Diaphragm cylinders are of two types i.e. flat diaphragm and rolling diaphragm. These cylinders have zero leak around the piston. 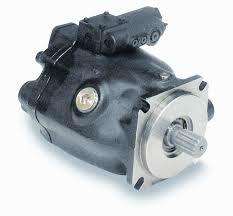 A hydraulic pump is a mechanical device that is used to convert mechanical power into hydraulic energy. The load that is responsible for the pressure is overcome with this device by creating sufficient power and generating a flow. A hydraulic pump has two functions to perform during operation: allowing atmospheric pressure to push liquid into the inlet line from the reservoir to the pump by the mechanical action creating vacuum at the pump, and supplying liquid to the pump outlet and then forcing it into the hydraulic system. A hydraulic pump is one of the main components used in manufacturing, construction, and machining equipment. It affects the machineries precision, productivity, efficiency and basically the overall system performance. When considering operational specifications for pumps, there are two that are most important, the pump type, and the pump stage. The types of hydraulic pumps range from radial piston, axial piston, gears- internal or external, and vane. Let the experts at Brown Engineering help you find the perfect pump for your hydraulic system! 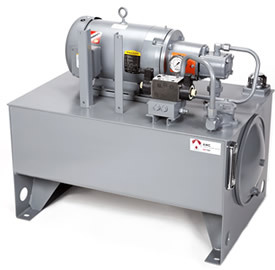 Hydraulic Power Units are the main driving components of hydraulic systems. Consisting mainly of a motor, a reservoir and a hydraulic pump, these units can generate a tremendous amount of power to drive most any kind of hydraulic ram. Hydraulic Power Units are based on Pascal’s law of physics, drawing their power from ratios of area and pressure. Hydraulic Power Units can generally be used in any application that requires heavy and systematic lifting or other requirements for the repeated use of powerful and directional force. Selection of the proper components for a hydraulic system is quite simple when you use the accompanying table and chart. Here is an example to illustrate their use. Assume your requirements are 20,000 bls. Of force, 28” stroke, and 7.5 seconds for full cylinder extension. So, using this example, the chart and table show that your components should be a 3” diameter 3000 psi cylinder and a hydraulic power unit with approximately 7 GPM and 3000 psi rating. Selecting the right hose and fittings combination usually belongs to the last steps in the design of a hydraulic system and its importance is often overlooked and underestimated. The right hose and fitting combination is however, vital for the overall functionality and long term service life of the complete system. 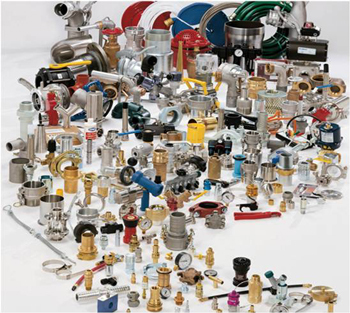 Find all the hose, fittings, and accessories you need at Brown Engineering. The combination of a hose and hose fitting(s) to make a hose assembly, is a critical process that needs to be carried out by professionally trained personnel who follow strict assembly instructions. Improperly assembled hose fittings can separate from the hose and may cause serious injury or property damage from whipping hose, or from fire or explosion of vapor expelled from the hose. The hose assembly must be operated within specific limits to maximize a safe and long term service life. Working Pressure- Hose and fitting selection must be made so that the published maximum recommended working pressure of the Hose and fitting are equal to, or greater than the maximum system pressure.